Whenever I teach that eternal life is received by faith alone in Jesus Christ alone, someone always quotes James 2:19 at me, that demons also believe. But if we study James 2:19 in context, we see that James is not refuting the gospel truth of faith alone in Jesus Christ alone. This study shows what James truly meant in James 2:14-26. Do you think the world was created over millions and billions of years? Or do you think that everything that exists was created in six 24-hour periods? 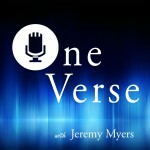 In this episode of the One Verse podcast, we will look at Genesis 1:5 and I will share my view on the days of creation.